The last couple of weeks have been quite something for acts of God. Here in the East, on Tuesday of last week we had the earthquake centered in Virginia, followed by Hurricane Irene, which moved up the coast last weekend. In some ways, Irene was not as bad as people had feared, particularly in New York City where the mayor went to such lengths to assure the safety of the public. Still, it did terrible damage and cost people their property and even lives. Of course, tens of thousands were also left without electricity. 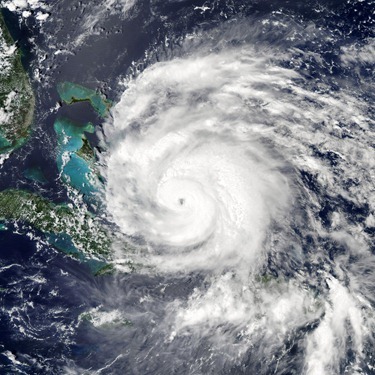 Having lived through hurricanes in the West Indies, I am very conscious of just how powerful these storms can be and the devastating effect it can have on people’s lives. In our own area, Vermont was the most seriously damaged. I’m always impressed at how people tend to be solicitous and generous in helping their neighbors during a time of crisis like this. I myself was affected by it because I happened to have a wedding in Washington D.C. on Saturday and was planning to come back on Sunday, but there were no flights or trains that day. 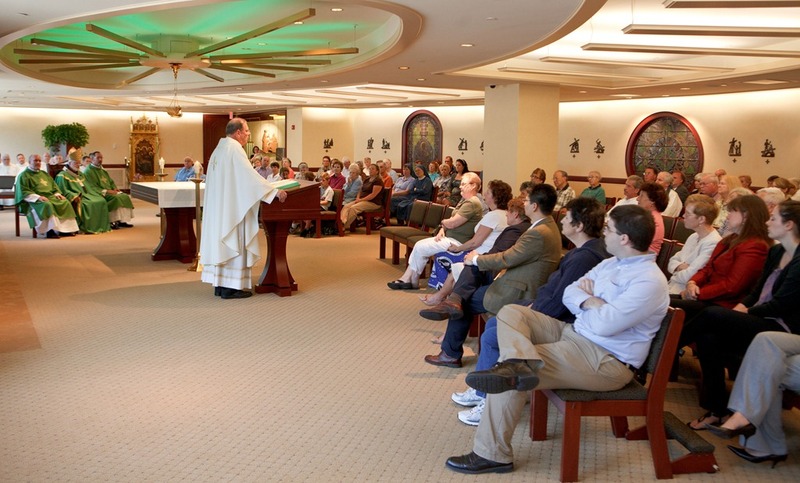 I had wanted to get back as soon as possible because on Monday morning we were having Mass at Holy Name Parish in West Roxbury with the elementary school teachers and administrators of our Catholic schools. 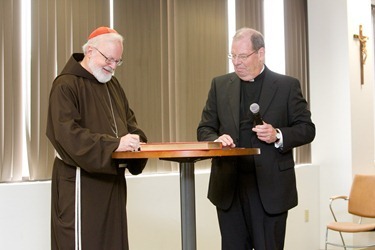 So, Bishop Robert Hennessey very generously agreed to take my place. He told them that he was the substitute teacher coming to say the Mass. 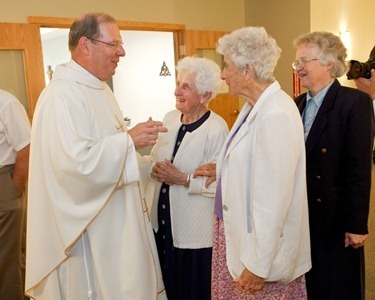 This week we had the “changing of the guard” of the Vicars General as Father Richard Erikson ended his tenure and we welcomed Msgr. Robert Deeley to take his place. 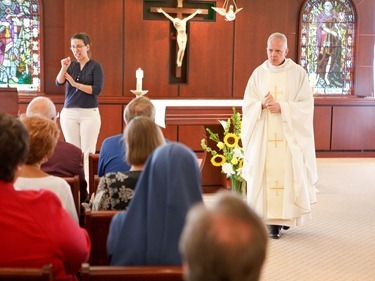 We had a farewell Mass and reception for Father Rich here at the Pastoral Center on Tuesday. The Mass was attended by his father, his sister and brother in law, and other friends. There were many priests, auxiliary bishops, staff from the Chancery and a number of people from Holy Name Parish, where Father Erikson has resided with Msgr. 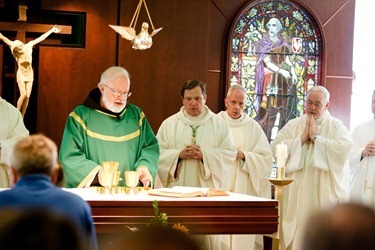 George Carlson and the other priests there. It was a very beautiful tribute to Father Erikson. I think people realize what a fine priest he is and how selfless he has been in serving the Church. We were very happy to see how enthusiastically people turned to out to be with him in this time of transition. He will be leaving shortly for Rome, where he will participate in the Institute for Continuing Theological Education, which is held at the North American College in Rome. 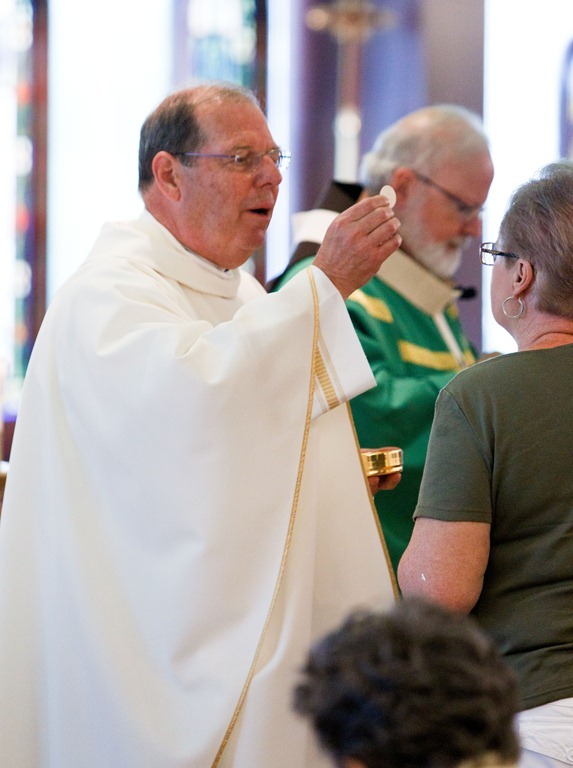 It’s a wonderful program that affords priests an opportunity for theological and spiritual renewal. It also affords them an opportunity to spend time in Rome — the center of Christendom — and to appreciate the Holy Father’s ministry and the universality of our Church. Having said goodbye to Father Erikson, on Thursday we officially welcomed Msgr. Robert Deeley our new Vicar General and Moderator of the Curia. 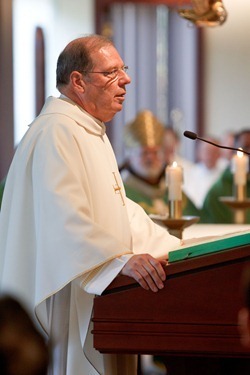 In 2005, Msgr. Deeley very generously acquiesced to my request that he help out at the Congregation for the Doctrine of the Faith at the Holy See. 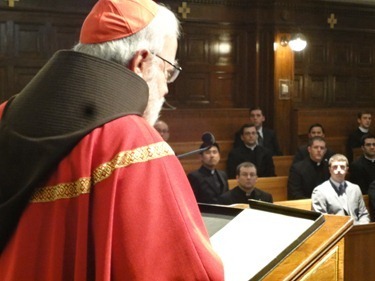 He did a wonderful job there and was also very good about getting together with our seminarians and Boston priests who are stationed in Rome. The nice feature of this tenure was that for much of the time he was in Rome his brother Kevin, who is a Navy chaplain, was also in Italy. So the Deeley brothers could get together on a regular basis. Msgr. Deeley also responded very generously when I asked him to return to Boston to assume this very important responsibility of Vicar General and Moderator of the Curia. I’m very happy that he’s back and we also marked his inauguration with a Mass of thanksgiving and a reception at the Pastoral Center. 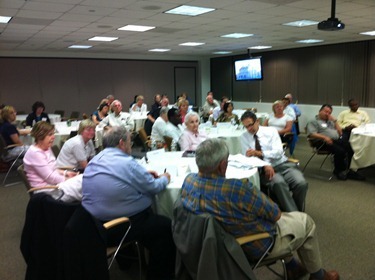 But before the reception with coffee and other light refreshments, we had the Pastoral Center staff gather in our auditorium. There, Msgr. 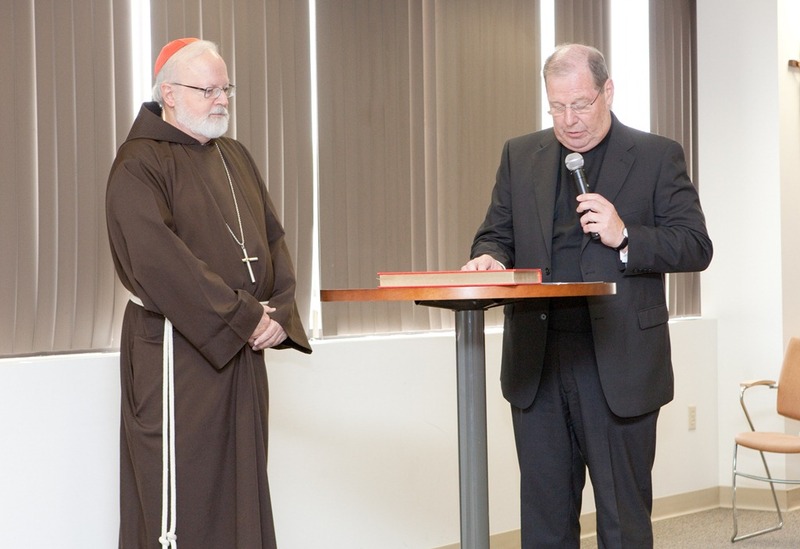 Deeley publicly read the profession of faith and the oath of fidelity. 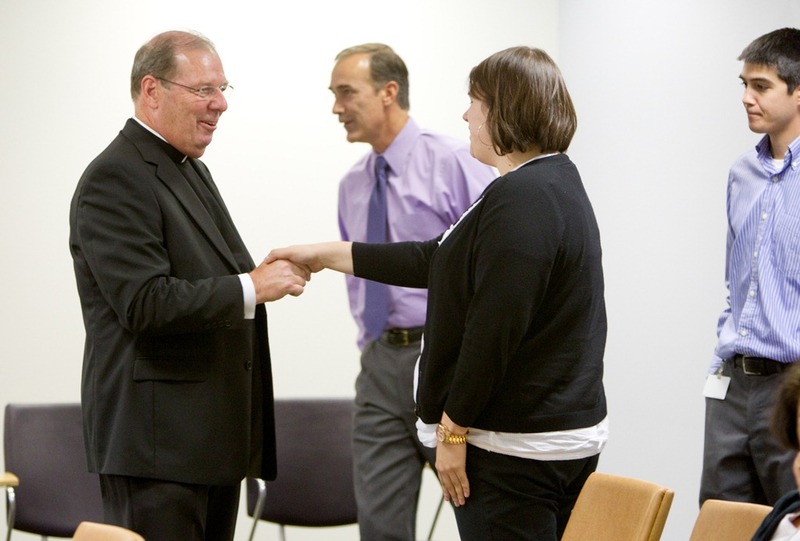 Monsignor received a round of applause from our staff and gave some brief remarks. He said that he was pleased to make these professions in public, in front of the staff. I think it was it a great witness for our staff and a reminder about what our mission is here. We certainly look forward to his leadership here in the archdiocese. This week we saw another changing of the guards, as it were, with the appointment of Archbishop Edwin O’Brien as the next Pro-Grand Master of the Equestrian Order of the Holy Sepulchre of Jerusalem. The order is one of the oldest organizations in the Church. Dating back to the time of the Crusades, they were originally an order of knights charged with protecting the sacred sites of the Holy Land. 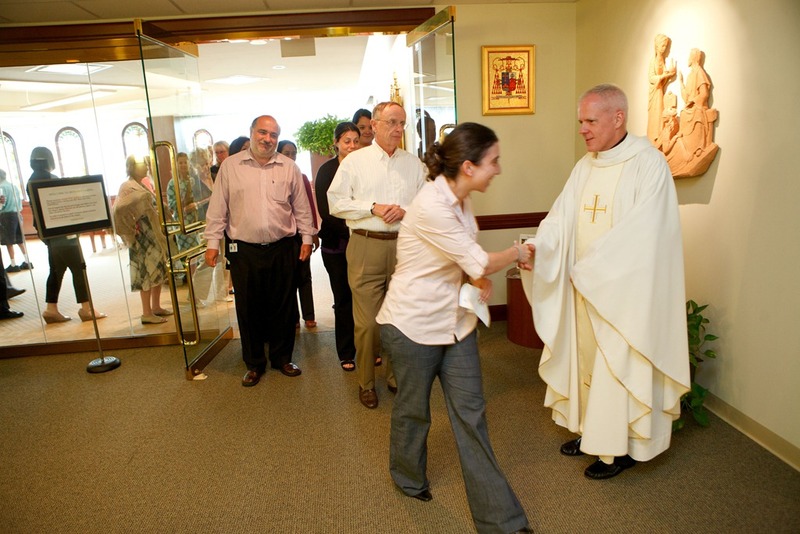 In modern times, the Order maintains that ancient mission by supporting the works of the Church in the Holy Land such as schools, clinics, hospitals and churches. 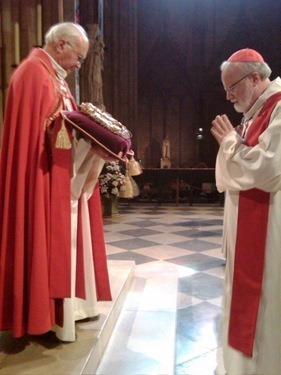 As I have mentioned in the blog before, I was once returning from Lourdes and was able to be part of the veneration of the Crown of Thorns — that very important relic is entrusted to the Order of the Holy Sepulchre at Notre Dame Cathedral in Paris. Cardinal John Foley, who was for so long the head of the Pontifical Council for Social Communications, was named Pro-Grand Master of the Order in 2007 and he recently retired, due to his age and health reasons. I believe he was the first American to hold that post, and I understand he did such an extraordinary job that the Holy See has decided to have another American to continue that work. Archbishop O’Brien is a natural fit for the position. He was, of course, rector at the North American College, so he knows his way around Rome very well. 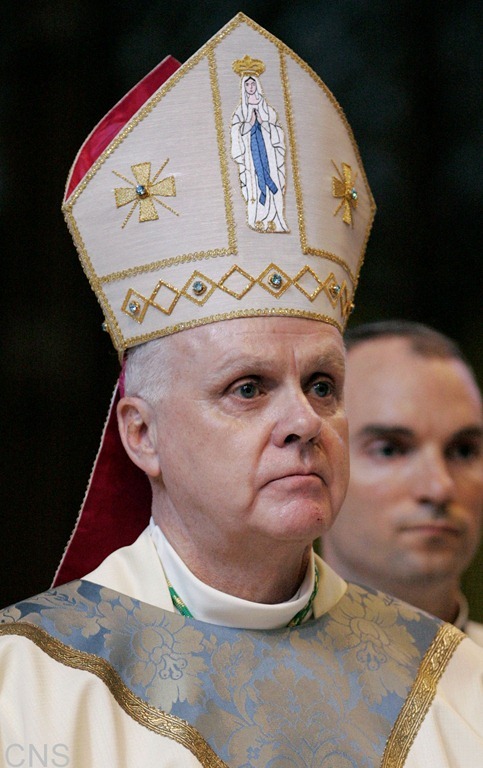 He has a military background as well, having been in the service himself, as well as having been the archbishop of our Military Archdiocese. He is certainly a man the Holy See has given many responsibilities over the years. He was in charge of our visitations of our seminaries in the United States and has done an excellent job as Archbishop of Baltimore. I’m sure that he will continue the wonderful work that Cardinal Foley has done with the Order of the Holy Sepulchre. Locally, we have an outstanding group, where I serve as Grand Prior. We have a history of wonderful leaders: The Ryans, Denis Looney, and now John Monahan. Another event I want to mention was visit last week by Father Pat Byrne, who is the superior of the Society of the Divine Word in Ireland. He was here to consult with Father Rodney Copp, the local director of the Pontifical Mission Societies to speak about the very important work of the Holy Childhood Association. 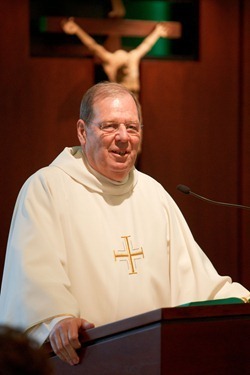 Father Byrne, of course, is a member of a very large missionary order and has great passion for mission animation educating people about the mission of the Church ad gentes. The Holy Childhood Association was founded in France in 1843 as a mission society similar to the Society for the Propagation of the Faith, but for children. 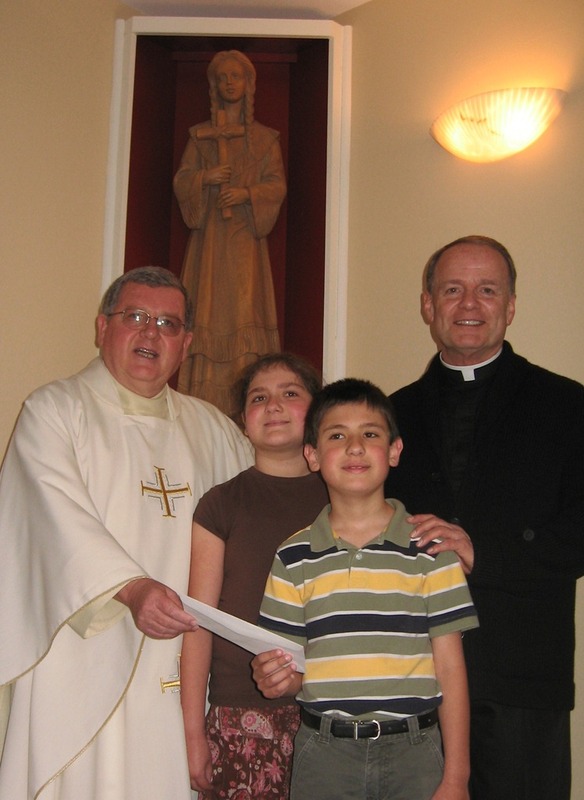 Its founder, French Bishop Charles Forbin de Janson was convinced that children, rich in faith and love, are capable of playing their own part in the Church’s mission of spreading the Gospel of Jesus Christ — and even of stirring adults to show the same missionary spirit. Today, all around the world, HCA continues to follow the founding vision of “children helping children.” After learning about the great needs of the world’s poorest children, our young people are invited to pray and offer sacrifices so that children in the missions may know Christ and experience His love and care. 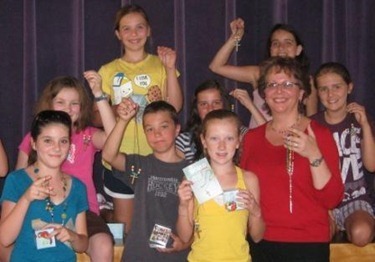 Each year over 3000 programs are funded by the Holy Childhood Association. In Uganda, HIV/AIDS orphans are cared for; in Ecuador, religious educational materials are printed for elementary school students. Children are fed what may be their only meal of the day in Haiti, while in India, children are prepared for their First Holy Communion. In the loving hands of missionaries, our children’s sacrifices become like the loaves and fishes in the hands of the Lord: multiplied to serve as many as possible. HCA is the Church itself teaching children that we are all called to be missionaries by our Baptism. Here in the Archdiocese, Catholic schools, parish religious education programs and even Catholic home school programs have mission education and animation materials available to enhance the faith formation of our young Catholics through our Holy Childhood Association office at the Pastoral Center. 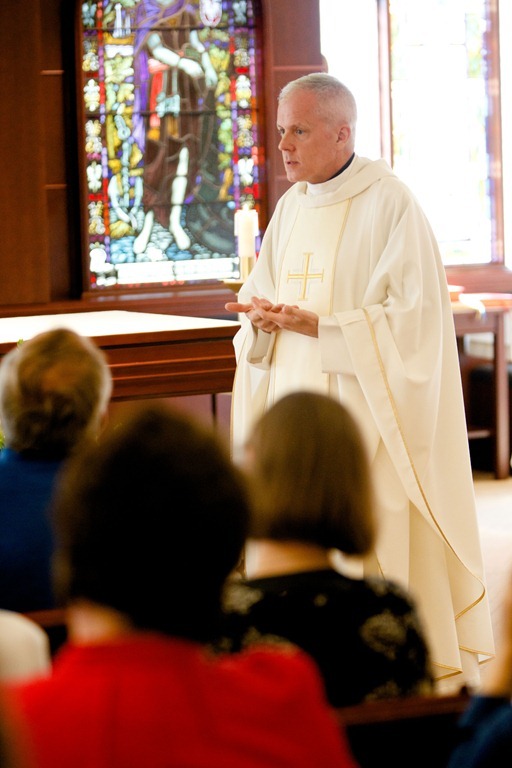 The mission education programs offered by HCA are varied so as to fit into the curriculum of any Catholic formation program, be it in a Catholic school or parish religious education program. 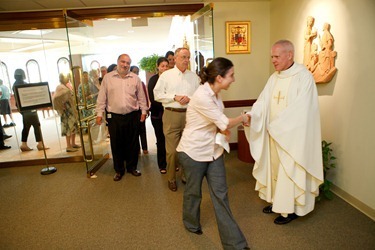 Maureen Heil, in our office of the Pontifical Mission Societies, does such a wonderful job coordinating this program. On Wednesday, we celebrated the Mass of the Holy Spirit at St. John’s seminary for the beginning of the academic year there. I talked on the Holy Father’s message to the seminarians at the Santa Maria la Real de la Almudena during World Youth Day. 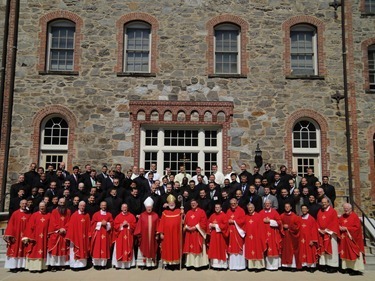 In fact, some of our seminarians were actually in attendance there. 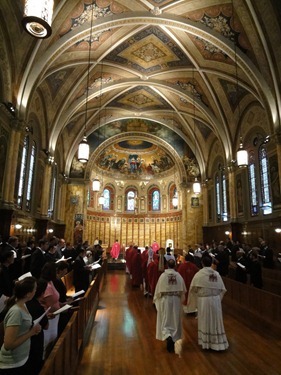 The apse of the chapel at St. John’s has been renovated this summer. 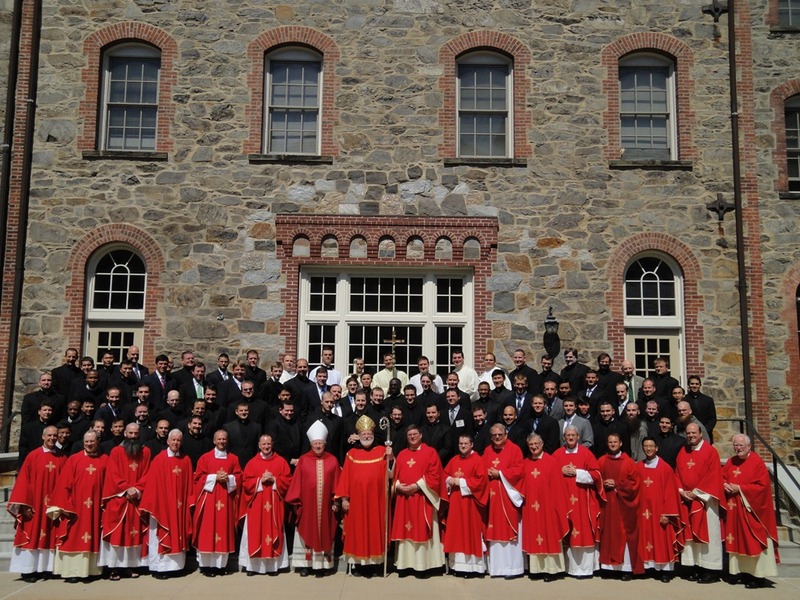 This year we have around 70 altogether seminarians studying for the Archdiocese, which makes us one of the larger contingents in the U.S. Of course, St. John’s is filled and we have a new diocese, the Archdiocese of Hartford, coming on board beginning to send seminarians to study there. 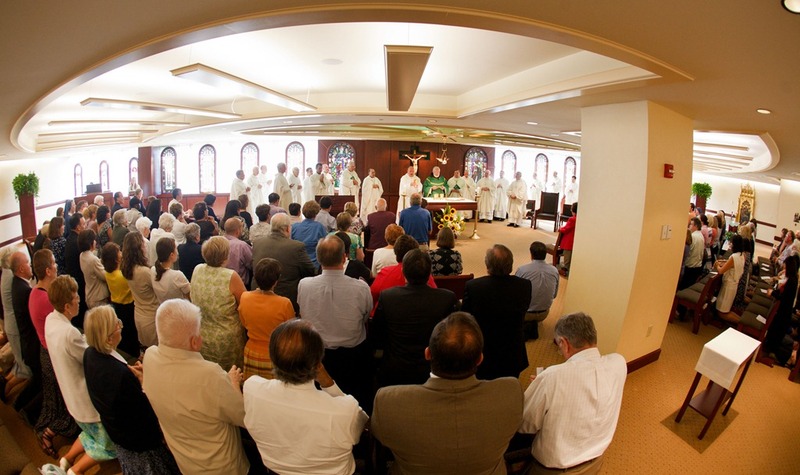 The Redemptorists have been sending some seminarians to study at St. John’s, as well. I wanted to welcome the seminarians from other dioceses and other religious communities who are starting there at St. John’s — it’s a great spirit in the house. 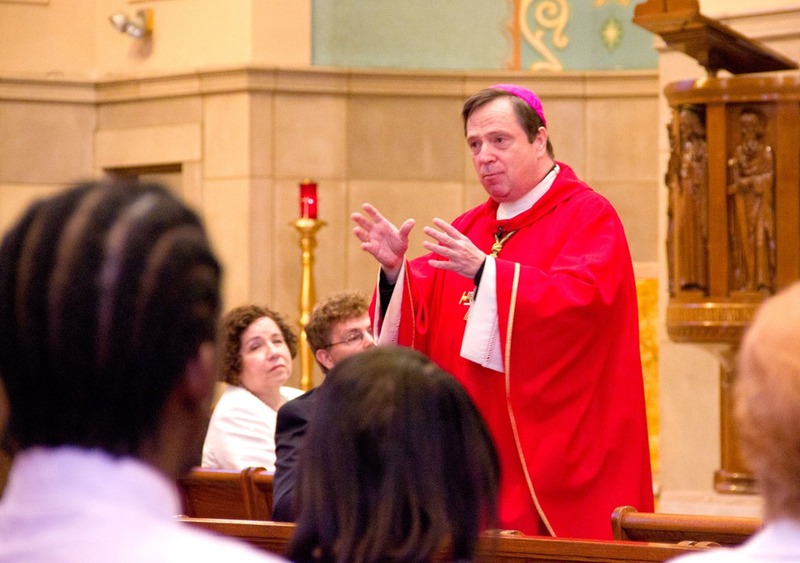 The rector, Bishop Arthur Kennedy, and the faculty were with us at the Mass, as well. 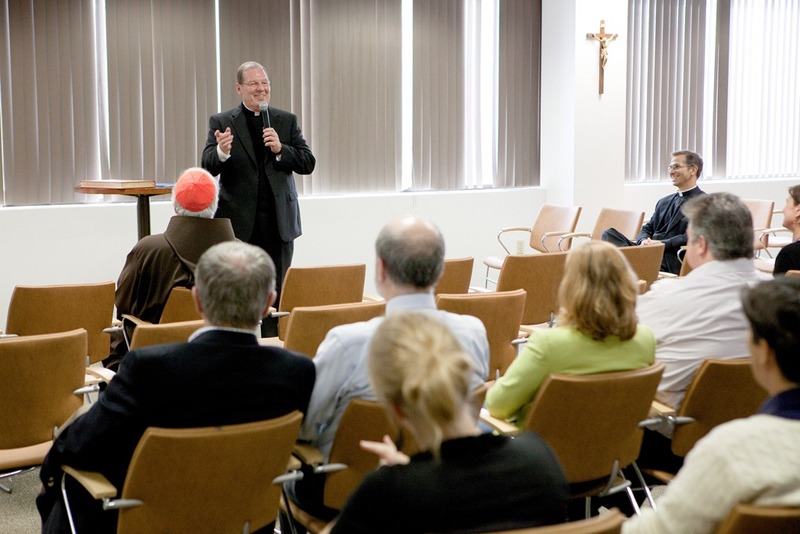 I told them how grateful I am to them for making St. John’s certainly one of the premiere seminaries in the country, and that we’re very proud of them. 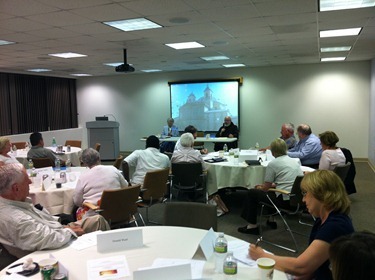 Later that day, we had our first meeting of the year for the Archdiocesan Pastoral Council here at the Pastoral Center. It was a very good turnout and we discussed a number of initiatives that the diocese is involved in, particularly pastoral planning and the conference on the Church’s teaching on social justice. 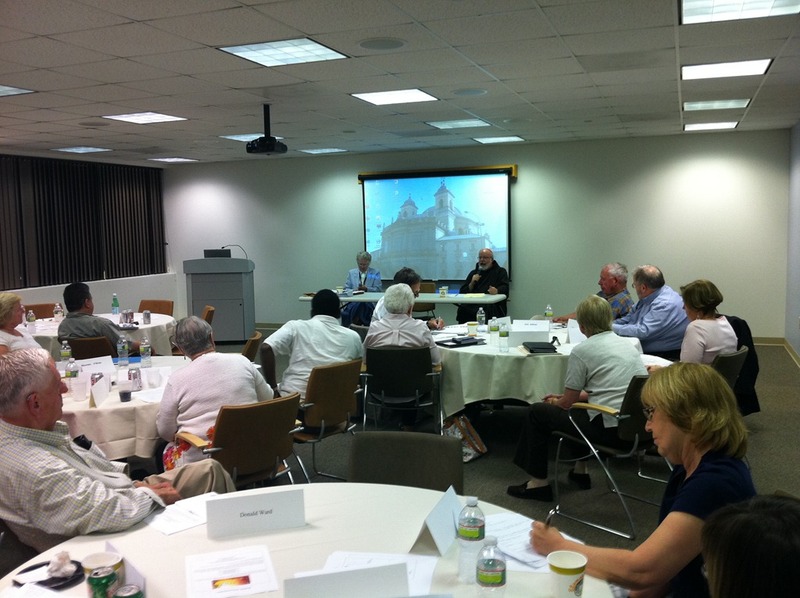 We talked about the Catholics Come Home program and how to continue those efforts of outreach and evangelization.